The group's annual convention will be held in Dallas starting Friday. The student-led March for Our Lives inspired adults into action also, including one woman who is helping lead visual demonstrations during the National Rifle Association convention this weekend. Susan Levine told ABC News that what she saw during that March 24 demonstration prompted her to take action now in her city of Dallas. "I was watching all the speeches on TV and I was so incredibly moved and blown away by how articulate and powerful these children were," she said, adding she "really felt like 'Wow, I really want to do something to help this movement grow and amplify it.'" She decided that the best way to chime into the national gun debate was to "cause some sort of disruption ... in a peaceful way" during the upcoming NRA convention. 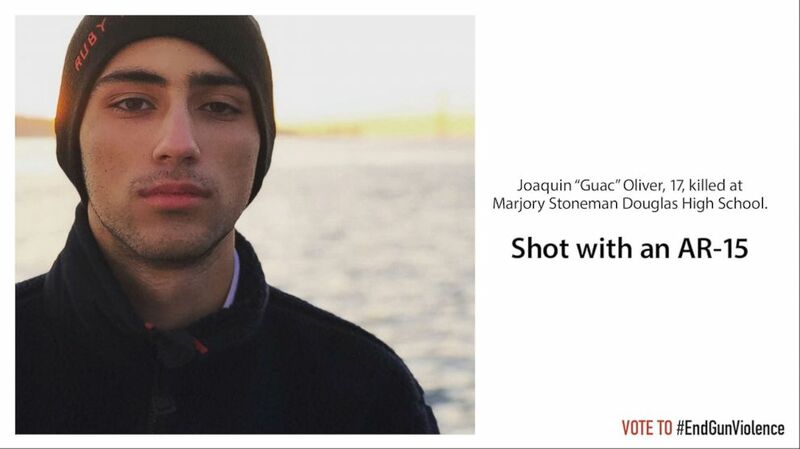 (Courtesy of Susan Levine) Joaquin Oliver was one of the 17 people killed at Marjory Stoneman Douglas High School in Florida earlier this year, and this image will be displayed in Dallas this weekend. Levine is collaborating with four gun safety groups including gun violence prevention group Giffords to arrange guerilla projections of gun victims on buildings in downtown Dallas near the site of the convention on Friday night. The projections will begin at nightfall, hours after both President Donald Trump and Vice President Mike Pence speak at the event earlier in the day. Pence's address, which was announced prior to Trump's, sparked some controversy because the Secret Service banned the presence of guns and knives in the room during his speech. 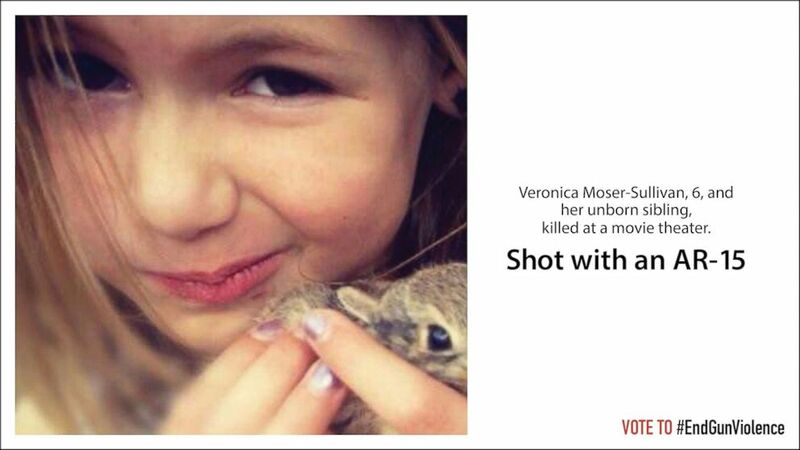 (Courtesy of Susan Levine) Veronica Moser-Sullivan, pictured, is one of the youngest of the 24 victims who will be displayed in the protest. She was fatally shot at the 2012 Aurora movie theater shooting. On Saturday, the visuals will move to the streets, with five double-sided mobile billboard trucks "weaving around the street closures," Levine said. Both the projections, which will range from eight to 15 stories tall, and the displays on the billboard trucks will show the pictures and names of 24 gun victims, along with the model of gun used in their death. The victims range in age from 6 to 51, and they were chosen, with permission from their relatives, to show the diversity of gun deaths in the U.S.
Victims from high-profile shootings like those in Aurora, Sandy Hook, and Pulse nightclub will be interspersed with others like Brishell Jones, 16, who died as a result of a drive-by shooting, or Aaron Rocha, 17, who was the victim of a "random road rage" shooting, Levine said. "It's not just about mass shootings. It's about the things that happen every day," Levine said, citing violent break-ins, suicides, and instances of being "in the wrong place at the wrong time" as often overlooked examples of deadly gun violence. Levine said she hopes that the visuals make the tens of thousands of convention-goers think about the impact of their weapons. "It's really not about being a liberal or a conservative or being for guns or completely against them," she said. "It's about life and I really don't want people to lose sight of that so the focus of the campaign really let's the power of the victims and their stories of gun violence do the talking." While she has familial ties to Parkland, Florida, which was the site of the deadly school shooting in February, she does not have direct ties to victims of gun violence. That isn't the case for Peter Ambler, the executive director of Giffords, which is one of the groups partnered in this demonstration effort. "I'm somebody who's lost a colleague to gun violence. I worked with [former Rep.] Gabby [Giffords] when she got shot and it's important that the NRA leaders and the politicians that they control are able to see with their own eyes the real tragic cost of their political agenda," Ambler told ABC News. "There'll be lots of macho talk but very little reflection on Congress's inability to address the country's gun violence crisis," he said.